Thank you to everyone who got in on the New Year Blowout deals I ran last week for site audits and the new Webmaster Level 6 training. I’m busy this week doing those audits and helping site owners find all of the security and performance drags on their sites. This week I’m also working on updating and creating new tutorials for the Webmaster Training. There’s a lot to understand about all the jargon and why things need to be done a certain way to ensure you cover all of your bases. I’m making the updates based directly on questions being asked and points being made in our private Facebook group. And I have to say, everyone’s contribution to that group makes it a gold mine of info and support. Thank you so much to all of the webmasters who ask and answer questions and give us tips and share your experiences with various plugins and services. One of the biggest misunderstandings about converting a site to HTTPS is whether or not you need the paid version of CloudFlare for your SSL. It used to be true that you did need the paid version. But CloudFlare has supported SSL in their free version for the last couple of years now. That doesn’t stop the misinformation from floating around the web, though. And that’s just one more reason why I’m continually updating the webmaster courses. In fact, that is the whole point – to get you up to speed and help keep you there. The overwhelming opinion that came out of the recent surveys I sent out and conversations with clients and the recent town hall meeting was that y’all are most interested in very focused workshops, like an intensive on a topic. You spend less time learning and just knock out what needs doing. Plus, I’m finding that everybody is enjoying having a private group associated with the workshop to ask questions as you do the homework. So, look for more of those in 2017 too. Thanks to everyone who came to the BlogAid Town Hall Meeting. I continue to hear from more folks who are catching the replay too. The setup on the Site Success Courses membership site is complex. And, as I mentioned in the meeting, big changes are coming for WordPress that will directly impact my decisions about how I want to go forward with those tutorials. 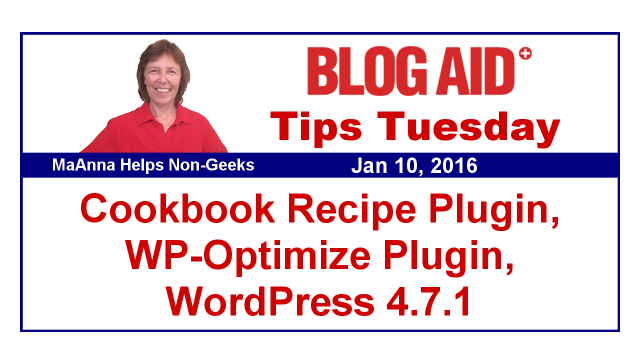 More on that in the WordPress Tips section. Plus, I’m in negotiations with a coach who helps beginner site owners. So, what comes of that will impact my decisions too. But I can tell you that the DIY SEO course will remain no matter what. I can also tell you that it will go to a subscription program due to the overhead of upkeep on it. And there will be big discounts to members for the live SEO related workshops and their associated Facebook groups too. I’ll have updates for you about the WP and VIP programs as soon as I can, and details on when and how membership changes will occur. For now, I’m keeping the store page hidden so folks can’t purchase anew, so you know I’m highly motivated to get on with this! One of the benefits I get from doing site audits so often is to see new trends in security, performance, and SEO. For the last month there have been drastically lower scores on both Google PageSpeed Insights and on the PageSpeed tab of GTMetrix. The last time this happened was just before Google re-released AMP about this time last year. Scores feel 15-20 points. Sites that had been testing in the 90s were suddenly scoring in the 70s. Now those same sites are scoring in the 50s or lower. I don’t know what changed, but Google is most definitely weighting its algorithm differently. And not just for mobile like it did with AMP either. Scores have dropped dramatically for desktop too. It seems to me that what Google wants is starting to run too contrary to a site owner’s ability to make money. To get your site to pass muster with AMP, you basically have to deliver a stripped down version that has few to no CTAs. And folks running ads for a living from any network other than the ones Google has a financial stake in too, can just forget about AMP. Same with optins and pop ups. You have to use a pretty long delay on desktop and be super duper careful about what sort of pop up you use at all on mobile to satisfy Google’s dictates on that. Both optins and pop ups are money in the bank for most site owners. On top of that, SEO ranking is getting to be crazy competitive. It’s tougher than ever to get your whole site to rank well. Ranking a post is different. It’s easier to get a single post to rank for a keyword or phrase compared to getting a whole site to rank for that. So, is full site SEO worth doing still? Because SEO is so competitive, then it really is more important than ever to get all of your ducks in a row. Getting all 11-14 levels of SEO on every post and page on your site adds up and may be the edge that gets you seen more than your competition. I’m also seeing a growing trend to skip SEO and go straight to buying traffic with Facebook Ads and such. To do that, you really need a good sales funnel in place. And to make it worthwhile, you need to plan on spending money, real money, into the thousands of dollars. Of course, that also depends on your funnel. Trend #3 in this post from the Content Marketing Institute, titled Five Content Marketing Trends to Watch in 2017 backs up what I’m seeing with more folks just buying their traffic. It’s a good strategy, as long as your potential clients are still visiting the platform. But as the recent presidential election got nutty during the late summer and fall, social media use has dropped. I doubt it will stay down for long, but it could cost site owners a lot if there is a downtrend just at the time you purchase ads. Trend #4 in that post shows a huge trend upward with email marketing. Here’s the thing. Email marketing always has and always will be a staple of business. The more folks you can get on your list, the better chance you have of reaching them directly. I’ve seen a lot of churn in my lists over the past 6 months as I change my focus and do my best to earn a living from all this great info I put out there, so I’m okay with that churn. The business was suffering from list fatigue. When I started sending more emails, especially with more of my offerings, I was seeing 2 unsubscribes for every new person that got on the list. It has finally stabilized and now is surging ahead. Here’s the thing. Never be afraid of losing folks when you need to make a change. That goes for your business and life in general. The developer of the PHPMailer code has patched it for this vulnerability. Subscribe to BlogAid News so you are always the first to hear about breaking news like this. There were 62 reported bugs and quirks in the WP 4.7 release. They have been addressed and we should see a rollout of the next minor update tomorrow. This will be an automatic update if you have not disabled that feature, and I hope you haven’t. But good idea to ensure you have a full backup before it rolls out. There are 18 more bugs that are currently being worked on and the fixes for those will be included in version 4.7.2, but we don’t have a release date on that yet. You may recall a couple of Tips Tuesday’s ago I reported on Matt Mullengweg’s State of Word address at WordCamp U.S. and then his interview with Brian Krogsgard with more about the new release cycle for WordPress during 2017. WP Tavern has a post this week with more details about that release cycle and the 3 main focuses for changes to WP. From this post, it looks like they are going to develop from the customizer out. That means changes to the editor will be developed from within the Customizer. Basically, they are creating a new user interface for the editor. Doing it this way means that you will be able to preview your post or page changes via the Customizer. This is WordPress’ first step toward revamping the entire admin area to be more like the interfaces in products like Wix. You get to actually see what the heck you’re doing while you’re doing it, instead of having to jump back and forth from the editor to a preview tab. It’s about damn time! Chris Lema has been calling for an overhaul like this for at least 3 years. And losing market share to products like Wix finally woke up Mullengweg. Now if he can just get over his dual attachment to WP.com and backwards compatibility, we might get somewhere. It scares the crap out of me to think that the Calypso interface in WP.com might ever make it into the WP.org version. I can see it coming. I can see that the entire WP library of tutorials I currently have in the Site Success Courses will have to be completely redone. That’s a substantial investment of time on my part. And there’s no way I can make them available for $1, or even $10. That kind of race to the bottom pricing is for places like Udemy that have a bunch of fluff courses that are 2 hours long and give you 10 minutes of solid info you can use. So, now you have a better idea of why I’m taking time to really think through what I want to do with that library and that part of the membership. On one hand, it could be a huge boon of new business. On the other hand, I could lose my shirt if everybody else decides to flood the market with YouTube videos. But, I can also see that it will be a whole year before these big changes hit. So, I’m trying to decide what I want to do in the meantime that is in the best interest of both me and my clients. UPDATE: 1/30/17 – The problem below was fixed by the dev. All good now. The whole premise of this premium plugin was to be super simple to use and just work well. They even boast about all the support tickets piling up for other recipe plugins. Well guess what? Welcome to the real world of plugin conflicts and different hosts and themes. One of my clients tried this plugin and it piled up so many errors that it had to be turned off. I sure hope they get it fixed soon because it looks pretty sweet, as far as use and looks. The backup plugin makers of UpdraftPlus have just purchased the database optimizer plugin WP-Optimize. See my Recommended Plugins list. They plan to move WP-Optimize into a suite of plugins that make up Updraft Central, which is a service that allows users to manage sites remotely. Ruhani Rabin developed the WP-Optimize plugin 8 years ago and will be brought onboard with UpdraftPlus as an advisor for its continued development. In other words, he’ll be around to answer their questions about his code until they get their sea legs with it. The plugin has already undergone a revamp of the underlying code to bring it up to spec. The plugin is still available for free in the WP repository and currently has 500k installs. No word on whether it will be pulled from the repository or not, but my gut tells me it will remain, especially because Updraft Central also has a free version in the repository. I want to thank webmaster Jeanne Biggerstaff of Biggerstaff VBA for the heads up on this. Ryan Sullivan at WP Site Care took an A2 turbo shared hosting account for a test drive. It performed pretty well for him with Turbo both on and off. You can read the full post for yourself. I had similar results in my tests too. That’s why I’m there and why A2 Hosting (aff link) is on my preferred vendor list. I too have seen a lot of churn these past months relative to my email list. Like you, I was getting 2 unsubscribes for every new subscriber. Since the first of the year, have seen a reversal where now I get two new subscribers for each unsub. Personally, I am happy to see the dead weight leave. PS – I very much believe you are the best kept secret on the internet when it comes to WordPress advice that is credible. Thank you for all that you do to educate us and keep our sites safe. Gaye, I’m sorry you’ve experienced churn on your list too, but on the other hand, glad to know it’s not just me! Thank you so much for your kind words and for you telling so many of your peeps about me. I may not see those private recommendations, but I know you are doing them and I really appreciate you!!! As always, thanks so much for the info. I appreciate the concise delivery as this nongeek’s head spins with tech overload, too easily. Have a great day, MaAnna! Glad it’s helpful Diane!! I do my best to keep it non-geek. But, have to cover info for webmasters too and sometimes that is a little geeky. Still, good for all site owners to know what’s going on all over. Can you share some details about the host or other plugins in play? We haven’t really had any reports of errors to that degree, so want to make sure we can get things fixed up if there’s something busted on our end. Also feel free to reach out anytime to [email protected] and we’ll for sure dig in and find out what’s going on. Thanks again! Hi Ryan, thanks for chiming in on this so the thread gets updated. It was on one of my client sites and the last plugin update fixed it. So, all good now as far as I know. I’ve updated the post.